Another American Beauty finds a great home ! 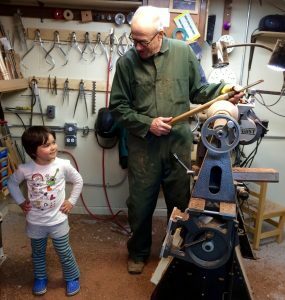 Tom Albrecht and his granddaughter: I don't call myself a "professional" turner. I was formerly an Industrial Arts teacher in the public schools and I fell into that work because I loved wood shop when I was in High School in the mid 60's. 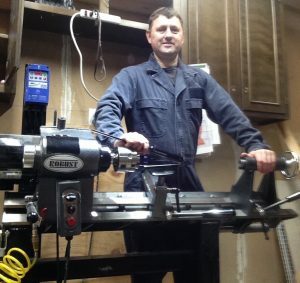 The wood lathe 2was always my favourite tool then because it was the only machine that I could use when I controlled the cutting tool and the wood was under power. Your American Beauty is my fifth lathe. I started with a Delta in 1973, moved to a Conover, then a Woodfast, then a Oneway, and now my Beauty. Your team has obviously put a lot of thought into your machines and the design. So far, my time with this AB has been incredibly enjoyable and functionally excellent. This is my last lathe-- you cannot come up with anything better. [In regards to the tool handles]: I really like the collet chuck design because of the simplicity of removing and exchanging the cutting tools without having to use an allen wrench. I’ve been using the Independence now for a couple of months and I cannot say enough about how much I love it. Chance took me to the Robust website early in 2015. Watching videos of the sturdy American Beauty lathe I was tempted. In the Autumn, I saw one at the local woodturning show (Phil Irons had a booth there) and was hooked. There was good natured teasing from woodturning friends. 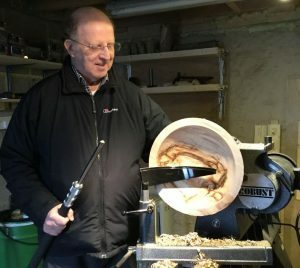 Some asked, ‘What will it do that your current lathe won’t?’ A great question and difficult to answer other than to ramble about Zen and the joy of everything to do with wood turning. Overall the view was ‘buy it if you can afford it’. Taking the plunge I phoned Brent and Deb English in Wisconsin who made it seem easy. By appointment I went to see Phil to ask a few questions – mainly about setting up the lathe. A couple of weeks earlier than expected Brent emailed to say the lathe was ready. They arranged a quote for carriage door to door. How easy it is to import depends a good deal on the company from whom you purchase; Robust made it all very easy. I’m now the delighted owner of a shiny new American Beauty and enjoying it enormously.